Today I am bringing you a review for the Toddler Tower from Simplay3. Right up front, I'll just say that if you have a little one this is extremely useful. 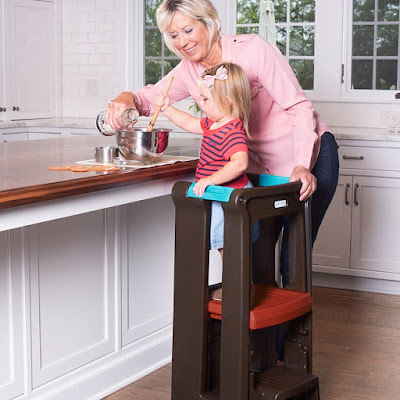 The Toddler Tower from Simplay3 is a children's step stool with three adjustable heights. This was designed and manufactured with complete thought of safeness for children. The step up platform is enclosed, the edges are rounded and the feet are rubber and anti skid. I like that the Toddler Tower grows with your child. It adjusts to three different heights, 12 inches, 15 inches and 18 inches. 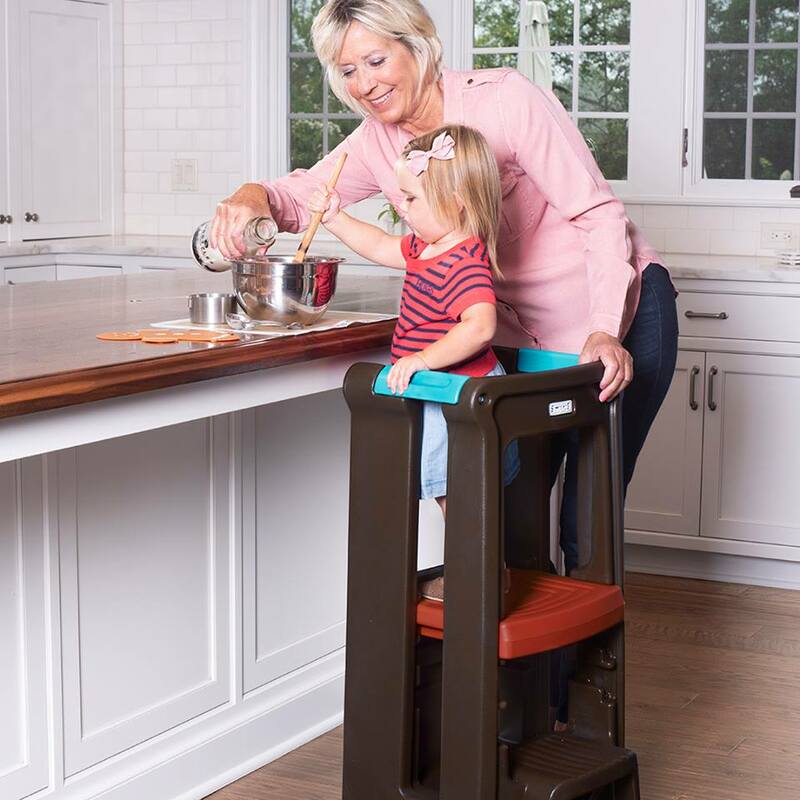 It supports toddlers and children up to 150 pounds. I'd also like to add that these Toddler Towers were also designed to look trendy, they don't stick out like an oddity in the kitchen. If you do want to store them in between uses they are lightweight and the compact design makes for easy storage. The 34.5 inches of height allows them to be easily stored under a counter. They were made proudly right here in the U.S.A. These were also made with a durable high quality double wall plastic construction. This makes it easy to keep them clean and sanitized. The Toddler Tower has eliminated us worrying that our grandson will try climbing on a chair. He can get on and off the Toddler Tower by himself without getting hurt. 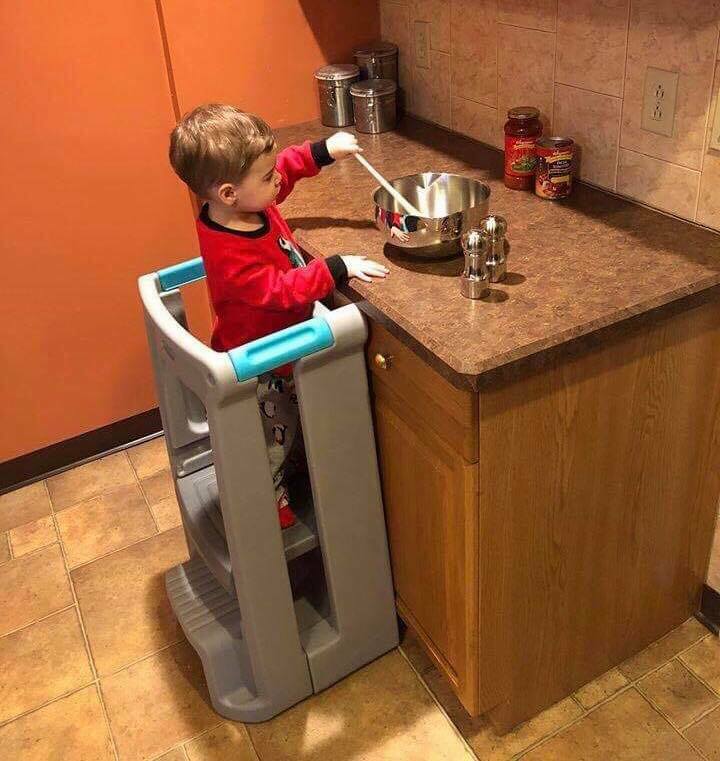 He loves to stand up there while I'm in the kitchen doing different chores, he will eat his snack on the counter or play with his play doh. It is very convenient for him and I. His favorite is to play with a bowl and spoon while I'm cooking. He also likes to color on his fun pages as I do any kind of writing at the table. We do many activities together as well such as making pudding and frosting cookies. The Toddler Tower is not a costly product. It will not break the bank. 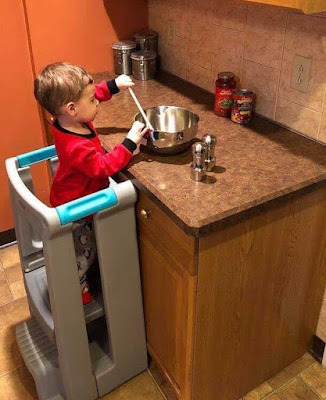 You cannot measure the peace of mind it allows you, knowing your child can safely go inside the barricaded step stool, it's not going to slip and slide across the floor, it is going to securely hold your child while you get tasks accomplished, especially the ones you like to involve them in. Whether you're 3 or 63, Simplay3 wants to bring more fun and joy into your life. They know that simple play or work, no matter what, makes us smile. They built their company to bring laughter and ease to life with products that have simple and smart designs that tackle everyday needs from children's play to home and garden. Through durable products that partner with you to help you through the day, products that reach, carry, hold, and support with strength, quality and great design, products that are made in America by American workers. You may wonder why the 3? They give you a hint they have done this before! They have built their companies based on family values, respect for one another, and respect for their valued customers. They do this because they love to hear laughter and to see people smile. Smiles are contagious so they want to encourage them again and again. It looks quite sturdy. It's awesome that your toddler can be close to you in the kitchen. It would help with their motivation at meal times because they can help make breakfast, lunch, and dinner! Well, that really is a great idea. I think kids would get a lot of use from this.